Afula (Ebreu: עֲפוּלָה‬; Arabic: العفولة‎, al-ʻAfūlaḧ) is a ceety in the Northren Destrict o Israel, aften kent as the "Capital o the Valley", referrin tae the Jezreel Valley. The ceety haed a population o 40,500 at the end o 2009. 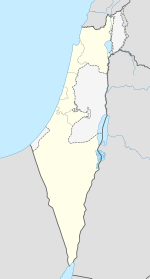 Locatit in the lawer Galilee region, Afula is roughly haufway atween Jenin an Nazareth. It lies on the site o the Israelite veelage ofOfel, the hametoun o the Biblical figure Gideon. It is mentioned in the Beuks o Keengs (2 Keengs 5, 24) in connection wi Elisha an the disciple o Elijah, who lived in the vicinity. The tent century Sultan Saladin foondit an Arab veelage named al-Fulah on the site. In 1799, durin Napoleon's Syrian campaign, the Battle o Munt Tabor wis fought aroond al-Fulah. In 1909 or 1910, Yehoshua Hankin completit his first major purchase in the Jezreel Valley. He bought some 10,000 dunams (10 km²) o land in Al-Fuleh (now Afula), which became the hame o Merhavia an Tel Adashim. This purchase also marked the start of bitter disputes atween Arabs an Jews ower the richts o tenant fermers who haed been evictit, an regardin the employment o Jewish or Arab watchmen for the land. The modren community o Afula wis foondit in 1925 bi the American Zionist Commonwealth, efter the completion o the purchase o the valley frae the Sursuk family o Beirut. The nearbi Arab veelage o Al-Fulah wis disbandit bi the turn o the century. At the time, the community wis served bi the Jezreel Valley railwey, which wis abandoned durin the War o Unthirldom. ↑ "Table 3 - Population of Localities Numbering Above 2,000 Residents" (PDF). Israel Central Bureau of Statistics. 2009-12-30. Retrieved 2010-11-22. Wikimedia Commons haes media relatit tae Afula.